Home > Open Calls > Call for Proposals: The Institute for Competitiveness & Prosperity is looking for panelists for TCI 2018! Call for Proposals: The Institute for Competitiveness & Prosperity is looking for panelists for TCI 2018! 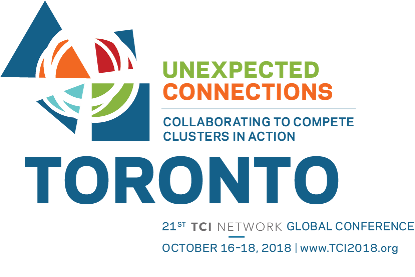 TCI 2018 will take place this year from October 16 to 18 in Toronto, Canada. TCI Network and the Institute for Competitiveness & Prosperity, host of the 21st TCI Network Global Conference 2018(“TCI 2018”) invite you to submit your proposal for an interactive breakout session (approx. 1 hour in length) during Day 3 (October 18, 2018) of the conference. 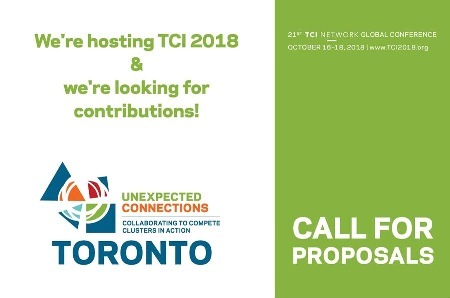 TCI 2018, explores the theme of “Collaborating to Compete: Clusters in Action” and the call for proposals focuses on collaboration across four sub-themes. Creativity is highly encouraged. This year TCI offer delegates questions to answer for the proposals, or a chance to submit their own questions for approx. 1 hour sessions that will consist of 3 panelists and a moderator. These sessions are designed to foster interactions between participants while sharing learnings, best practices, and ideas, and solving problems related to cluster development, economic growth, international trade, and innovation. We are seeking proposals from a wide variety of individuals interested in being a panelist. We look forward to submission frompolicy makers, cluster practitioners, business leaders with a case study to share, and academics who study clusters. Proposals will be accepted until Friday, April 13, 2018 and notifications will be sent out on Wednesday, May 2, 2018. To read the full guidelines for the call for proposals and to submit your proposal, please visit: https://www.tci2018.org/call-for-proposals/. Questions? Email TCI at info@tci2018.org.